The world will not end tomorrow. The Sun will rise on the morning of December 22 and find most of humanity still living. I can say that with a great deal of confidence, though my scientist's brain tells me I should say the world "probably" won't end tomorrow. After all, there's a tiny chance, a minuscule probability...but it's so small we don't have to worry about it, just like we don't have to worry about being struck down by a meteorite while walking down the street. It could happen, but it almost certainly won't. My confidence comes from science. I know it sounds hokey, but it's true. There's no scientific reason—absolutely none—to think the world will end tomorrow. Yes, the world will end one day, and Earth has experienced some serious cataclysms in the past that wiped out a significant amount of life, but none of those things are going to happen tomorrow. (I'll come back to those points in a bit.) We're very good at science, after centuries of work, and the kinds of violent events that could seriously threaten us won't take us by surprise. So where does this stuff come from? Whose idea was it that "the end of the world will be on December 21, 2012"? The culprit, according to those who buy into the idea, is that the end of the world was predicted by the Mayas in their mythology, and codified in their calendar. However, it's pretty safe to say that the Mayas didn't really predict the end of the world, even though I don't know much about the great Mayan civilization that existed on the Yucatan peninsula in what is now Mexico from antiquity until the Spanish conquest. 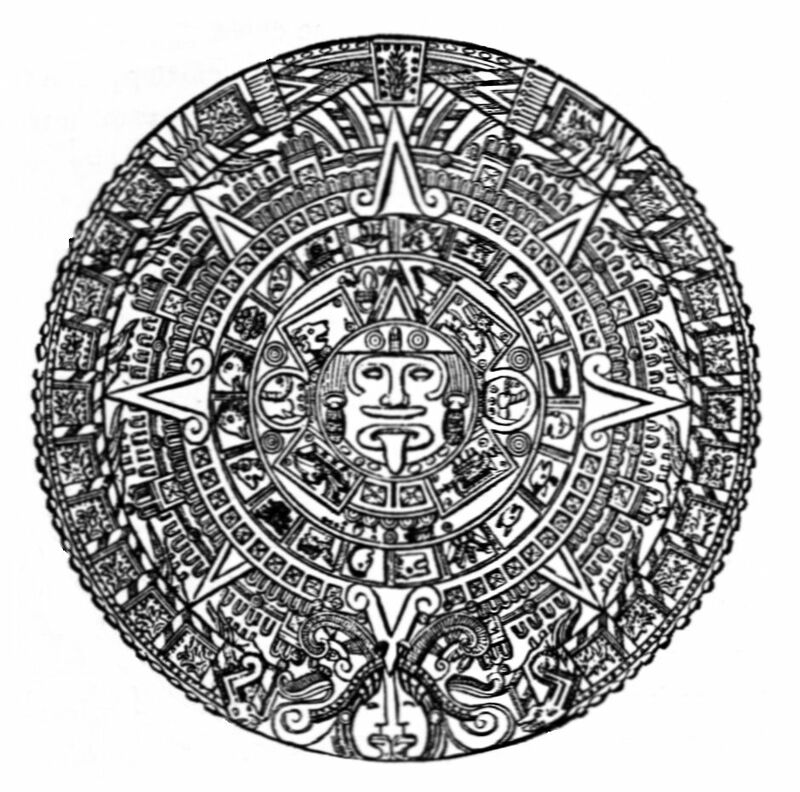 In the "Long Count," one version of the Mayan calendar known to us, the present world came to be on August 11, 3114 BC. That world will end at the close of the 13th b'ak'tun from that creation day, which happens to be December 21, 2012. However, there's good reason to think that the Mayas didn't believe this would be the end of all things: other calendars exist that refer to an even longer span of years, stretching thousands of years into the future! Even more importantly, though: the Mayan cosmology (their view of the universe) was cyclic, as in many other religions. This world was not the first in this cosmology, and it won't be the last. In such a view, the true universe is eternal, and the cycles of time are a kind of divine rebooting, which don't really end anything. The end of the 13th b'ak'tun might be a transformative event in the Maya cosmology, but it's not the end of the world. Frankly, I'm not sure why we should care even if the Mayas did believe this was the end of the world. As I said previously, there's no scientific reason to think the world will end tomorrow. But maybe you might think there's a non-scientific reason—divine intervention to wipe out the Earth, perhaps. However, I'd venture to guess that most of us don't adhere to the Mayan religion. Their gods are not the gods most people worship. The prophesied arrival on Earth of Bolon Yookte' K'Uh, the Nine-Footed God is not something central to my belief system, and probably not yours either. In fact, millennial thinking is far more a Christian thing than it is a Mayan thing—or frankly most other religions. When people talk about the supposed end of the world tomorrow, they use the Christian terminology: Armageddon (referring to Megiddo, a place in northern Israel, named in the Book of Revelation as the site of the last battle) or the apocalypse (literally the "uncovering", when all that was hidden becomes revealed). These weren't concepts in the Mayan religion, and nothing in the Christian religion says the world will end on December 21, 2012. Science tells us the world won't end tomorrow. It also tells us the Mayan cosmology is wrong: time doesn't go in cycles forever. Earth began 4.5 billion years ago, and will end in about 5 billion years more—at least as a livable world, which is what counts for us. In between its beginning and end, it is defined by cycles: the length of rotation (days) and the time to travel around the Sun (years), with its associated seasons. Other cycles are pretty arbitrary: centuries and b'ak'tuns don't have any particular significance in terms of astronomical events. The end of the world as we know it will happen in about 5 billion years, when the Sun ceases fusing hydrogen into helium in its core. When that happens, the Sun will grow into a red giant star, swallowing up Mercury and Venus. Earth probably won't be devoured, but with the Sun's surface so much closer, things will become distinctly unpleasant. It's unlikely the atmosphere or oceans could survive, meaning the end of most life. (Some microbes could probably continue to live underground. That kind of thing is a story for another day.) However, 5 billion years is a long time from now. Could another cataclysm overtake us before that time? Yes. As you may know, about 65 million years ago, a large asteroid smashed into Earth, an event that at least helped end the reign of dinosaurs, and ushering the extinction of many other species. Unfortunately, we can't rule out the possibility that could happen again. There are enough asteroids and comets in our Solar System that could eventually cross orbital paths with Earth; if a large specimen collided with us, it would be devastating. However, we're talking about tomorrow. No asteroid will strike Earth on December 21: astronomers keep careful track of everything near our planet, and nothing we know of is on a collision course with Earth for the near future. Asteroids and comets are really the only things we have to worry about doing serious damage for life on Earth, but you can sleep easy tonight and tomorrow night: we're safe. Some people have talked about fairly far-fetched ideas: alignments of planets, or lining up Earth, the Sun, and the center of the galaxy. The planets of the Solar System aren't aligned tomorrow—the image shows where several of them are in relation to the Sun at noon. Jupiter isn't anywhere close to the planets you see. You'd need a pretty strong imagination to say they're lined up in any way: while they do lie along a line, that's the way they always are, since they all orbit the Sun more or less in the same plane. 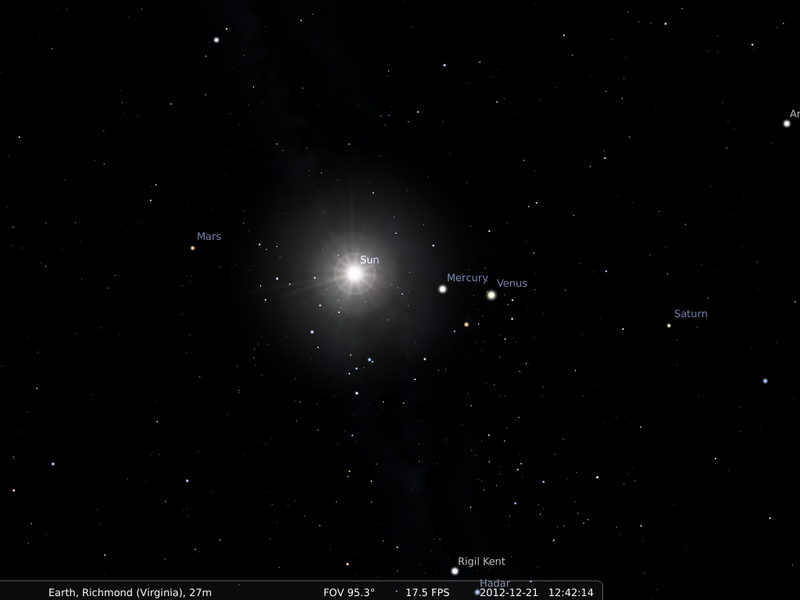 Alignment with the galactic center is even more simple to dismiss: about once a year, the Sun appears aligned with the galactic center in the sky. And nothing happens. Another explanation I've seen involves a mysterious planet called "Nibiru" or "Planet X," which either will collide with Earth or otherwise generate a baleful influence. Phil Plait, the Bad Astronomer, has a lot about the Nibiru nonsense, so I won't repeat what he says. Suffice to say Nibiru doesn't exist: there's no evidence for it, and (surprise!) it's not anything that came from Mayan mythology to begin with, so there's no reason to associate it with a December 21 apocalypse. Science, I think, is reassuring in the midst of panic. Why people like to scare themselves and others with misguided ideas of the world's end, I am not qualified to say. I don't know how many people are convinced the world will end tomorrow, compared with the number of people who are either wholly skeptical or those who might be a little worried. However, let me reassure you again: the world will not end tomorrow. We can take comfort in the knowledge that December 22 will come, 2012 will end, and a new year—a new cycle—will begin. Any remaking of the world is up to us, so rather than worrying about imaginary apocalypses, let's commit to improving the lives of those who live on our magnificent planet. "As you may know, about 65 billion years ago..."
Yes, we very much wanted to fix that, and thank you for pointing it out. The 2013 Flame Challenge Question: What is time?